Question- How would you feel if your child came home with this as a homework assignment in their Math class? Here is a link to the full lesson. I re-posted, on Facebook, the above homework lesson that garnered a lot of response. The lesson is a perfect example of what the shift away from knowledge-based academics to the behavioral looks like. This is known as “transdisciplinary” in Common Core/College and Career Readiness. Transdisciplinary is when the function of the subject matter and course frameworks are all used to guide how a student views the world. The technical term most commonly used is lenses. Effectively these lenses become the values, attitudes, and beliefs the students are to be taking away from the curriculum. It is NOT about math. It is about attitudes, values, beliefs, and behaviors. Veteran teachers began commenting on the post. They knew the danger of this lesson. While many parents were correctly angry about their child being exposed to talk of sexual abuse, in a math lesson, that is age inappropriate. Veteran teachers know, Maya Angelou aside, this lesson is a complete dumbing down of students. Below is a comment from veteran teacher and education reform researcher Diana Anderson – Whom, I am forever grateful to for her insight and wisdom. Teach math. In ELA, teach Angelou. No need to blend them. To which I responded…  You must be a veteran teacher. Who is more likely to understand the danger of this type of lesson? Veteran teachers know, just as Diane Birdwell said. Teach Math. The student is dumbed down in math because they can get the right answer based on the story, not because they actually know the math. Veteran teachers know the way to success in life is to actually know how to do the math problem. 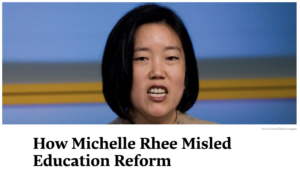 Interestingly, Dallas ISD has been a major target of Ed Reformers such as former Superintendent Mike Miles and former Dallas ISD School Board member, and current Texas Education Commissioner of Education Mike Morath. There has been a major push in DISD and frankly across the state and country to eliminate veteran teachers who actually do know better. Did you know that Texas Commissioner of Education, Mike Morath, has restructured the Texas Education Agency? 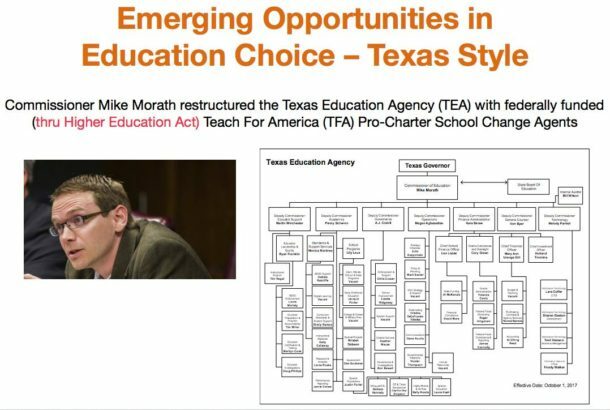 Republican Governor Greg Abbott appointed, Commissioner of Ed, Mike Morath has completely restructured the TEA with federally funded (thru Higher Education Act) Teach For America (TFA) Pro-charter school community organizers. One of the most controversial hires being AJ Crabill, Deputy of Governance of the TEA making $180k a year and whose highest attainment of education is a high school diploma. Additionally, Crabill, also known as Airick West, was a major Democrat community organizer. It looks like he had to change his name due to ethics violations in Kansas City. Another extremely controversial hire was Penny Schwinn, the Texas Education Agency’s deputy commissioner of academics. As noted in the video “The New Patronage”, Mike Morath has restructured the TEA to align with a carefully crafted network of reformers trained by TFA, Broad Academy, and the Aspen-Pahara Institute put in strategic positions of power in order to disrupt the traditional public school system. The agenda undermines local governance and circumvents the democratic process. The question is, with the PUSH for Teach for America (TFA) Leaders, NOT Teachers. Will America’s children be dumbed down? As stated above, veteran teachers would know the lesson above is wrong on so many levels, not the least of which is the complete dumbing down of students. Especially students whose families can not afford a tutor to actually teach their child math. A Teach for America leader/facilitator has 5 weeks of training. They are basically trained to go find lessons on the internet. They do not know any better. They just know… Google it! Below are the purposes behind the College and Career Readiness/Common Core National Standards now codified into law through the passage of the Workforce Innovation and Opportunity Act (WIOA) and the Every Student Succeed Act (ESSA). Shifts Education Philosophy– from an education of Opportunity (Equal Opportunity) based on academics; reading, writing, math, and history to an education of equity (Equal Outcomes) based on attitudes, values, beliefs, and behaviors. Broadened Impact – The Common Core National Standards expand the target from K-12 (Kindergarten through 12th grade) to a P-20 (Pre-school through College, Trade or Graduate School) system. Testing Based Outcomes– The Common Core National Standards shifts from the “Mental” (Academics and Knowledge-Based Tests) to “Behaviors” (Performance Standards and Competency for the workforce). Adjustments to Ideology– Change American’s worldview from nationalism into globalism and allows for a government controlled economy known as ”Dirigisme” or the more common use–a dirigiste economy. It means essentially a state-directed economy. Dismantle traditional public schools– With locally elected school boards, in favor of charter-like structures (public/private partnerships) that will be forced to generate student data for global corporate profit and state control. These globally aligned college and career readiness standards are now in ALL 50 states. Take the time between now and Thursday, Feb. 8th to watch the important videos in this link. Then, join us Thursday night for the Women On the Wall Communication Team Conference Call. Call in with questions for our special guests, Jane Robbins and Jakell Sullivan – Call-in information can be found by clicking here. 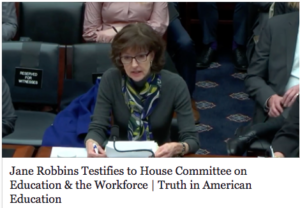 Jane Robbins, a senior fellow with American Principles Project, was one of four witnesses to testify during the House Committee on Education and the Workforce’s hearing on Evidence-Based Policymaking and the Future of Education. Below is an outstanding breakdown by Dr. Karen Effrem of Jane Robbins testimony to the House Education Workforce Committee.